Our house is that place where we feel safe, comfortable, where we can be ourselves. Therefore, it is important to get comfortable environments in which to spend that time of rest and disconnection. Today we will see some ideas to decorate a cozy room , a room where you can enjoy reading a book, our favorite series or a nice evening with friends around a rich dinner. It is a space in which we spend much of our time, so it is important to prepare it so that we feel as comfortable as possible. To provide warmth to any environment, carpets and textiles on the sofa or on armchairs, such as wool or wool blankets, for example, are a wonderful option. They get a very cozy touch to your living room, and you can complement them with comfortable cushions. The stay will automatically become much more pleasant. The sofa is the most important element of the room. It will be useless to try to design a nice decoration looking for that cozy feeling if when we sit down to enjoy it we are uncomfortable. Therefore, you should look for a sofa that is comfortable and that aesthetically contributes to promote all this warmth that we are looking for. A too crowded room may not help us to relax as much as we would like. However, we will not be able to create that serene and pleasant atmosphere if we leave it totally soulless, without any personal object that offers that image of a home that is truly welcoming. Therefore, it is important that you include decorative elements in the living room. Ideas: plants and flowers that provide joy, personal photos that bring you good memories of moments and people or some candles to favor a pleasant lighting. We have already seen in previous articles that colors help us generate different sensations. To achieve that cozy atmosphere soft tones or pastels are wonderful. Bet brown, earth or green, inspired by nature, for example. It’s about using calm tones and avoiding, for example, red walls or other bright colors. In addition, with the soft and clear colors the light is reflected better and that also helps your room to be much more serene and comfortable. The wood is one of the most warm and cozy decorating materials available. If your floor is not made of wood you can counteract the cold feeling with large rugs, for example, but whenever you can, introduce this material in your living room. Do it, for example, through the furniture, the coffee table, decorative elements such as fruit napkins or even one made with pallets . And if you have beams in your living room, leave them in sight . 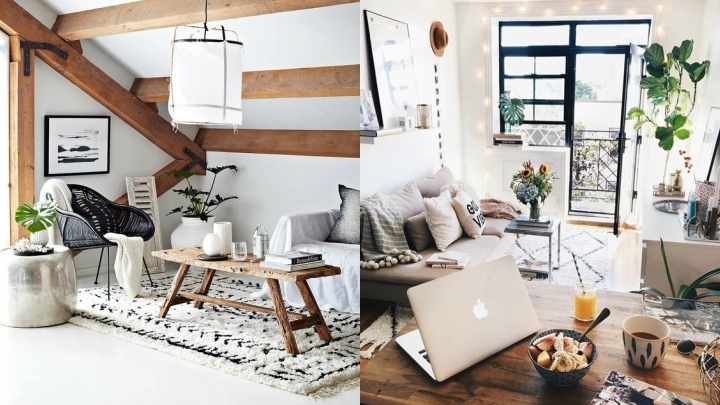 No doubt lighting plays an essential role in the creation of this cozy room. If you are lucky enough to enjoy some large windows you already have a lot of livestock. But if this is not the case, you can use artificial light to create the pleasant environment we are looking for. Do it with a floor lamp, for example, that illuminates your favorite corner of the room. You can also place a spotlight on the wall and help you with candles or some led garlands to get a dim lighting when necessary.